Popping the question to her boyfriend of ten years was part of Delia’s plan; seeing his panicked text to another woman that same night was…not. 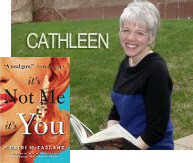 It’s Not Me, It’s You is a darkly comic journey of self-discovery through misadventure. Witty, sometimes wacky, but also pointedly real, Mhairi McFarlane’s story is one to cheer. A. Read a book written by a new-to-you author.